The InstaPart web page lists surplus electronic components that Signalogic has onhand. Surplus components at Signalogic result from minimum order requirements, last-minute component changes, and other unpredictable factors that occur during manufacture of DSP, data acquisition, and telecom boards developed and marketed by Signalogic. Only components shown are available. Absolutely no back-orders, no searching or other tracking-down of components is allowed. What you see is what you can get, period. Component testing may or may not be possible depending on availability of legacy test platforms, nature and form-factor of the device and other factors. Minimum order amount is USD 100. Handling charge is 10% of order amount. No exceptions. All orders must be shipped pre-paid COD. No exceptions. Shipment method can be DHL (overnight) using Signalogic account which adds shipping cost to order, or via FedEx or UPS using customer account. No UPS ground, US Mail or other shipment methods which do not allow automated tracking are allowed -- no exceptions! Credit card orders are Ok; amount will be validated prior to shipment, and charged at time of shipment. VISA and MasterCard accepted. Below is a table showing available component inventory. CY7C1049B-15VC 512k x 8 SRAM, 15 nsec, 5V. 36-pin SOJ, 400 mil SOJ. 149 18.75 New. Not stored in dry pack. WE DSP32C 080 F35 Lucent 32-bit floating-point DSP, 50 MHz 164-pin PQFP 10 Call New. Not stored in dry pack. WE DSP32C 080 F35 Lucent 32-bit floating-point DSP, 50 MHz 164-pin PQFP 5 Call Soldered on board once, tested at 80 MHz, removed; never used by customer. All in good condition. 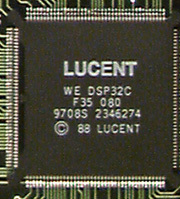 WE DSP32C 080 F33 Lucent 32-bit floating-point DSP, 50 MHz 164-pin PQFP 1 115 New. Not stored in dry pack. 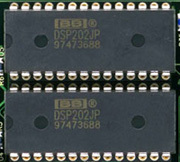 WE DSP32C 080 F33 Lucent 32-bit floating-point DSP, 50 MHz 164-pin PQFP 2 100 Soldered on board once, tested at 80 MHz (mistakenly), removed; never used by customer. All in good condition. DSP202 Burr-Brown 16-bit dual D/A converter 28-pin PDIP, 600 mil 3 75 New. Not stored in dry pack. DSP102JP Burr-Brown 16-bit dual D/A converter 28-pin PDIP, 600 mil 1 75 New. Not stored in dry pack. CS4216-KL Crystal Semiconductor 16-bit sigma-delta code 44-pin PLCC 90 20 New. Not stored in dry pack. 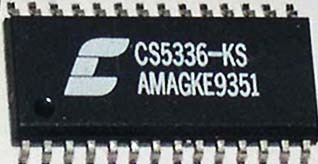 CS5396-KS Crystal Semiconductor 28-pin SSOP 1 call New. Not stored in dry pack. CS4328-KS Crystal Semiconductor 28-pin SSOP 21 call Mix used and New. Not stored in dry pack. CS4328-KP Crystal Semiconductor 28-pin PDIP, 400 mil 9 call New. Not stored in dry pack. NE5532E FairChild Semiconductor 16-pin SSOP 12 call Mix used. Not stored in dry pack. PGA204AP Burr-Brown programmable gain inst. amplifier (1,10,100,1000) 16-pin PDIP, 300 mil Instock 15 New. Not stored in dry pack. KM68257BP-20 32kx8 SRAM 28-pin DIP, 400 mil 28 5 New. Not stored in dry pack. TC55328P-20 32kx8 SRAM DIP 3 5 New. Not stored in dry pack. TC55328P-25 32kx8 SRAM DIP 4 5 New. Not stored in dry pack. UM61256AK-15 32kx8 SRAM DIP 8 5 New. Not stored in dry pack. UM61256CK-20 32kx8 SRAM DIP 2 5 New. Not stored in dry pack. UM61256FK-15 32kx8 SRAM DIP 4 5 New. Not stored in dry pack. GS70524T-12 3.3V 32kx24 SRAM 100 pin TQFP 4 10 New. Not stored in dry pack. GS71024T-12 3.3V 64x24 SRAM 100 pin TQFP 4 10 New. Not stored in dry pack. XDVC5410GGW DSPs 3 75 New. Not stored in dry pack. MCM6226BBXJ15 5V 128kx8 SRAM corner power & ground 32-pin SOJ, 400 mil 4 25 New. Not stored in dry pack. CY7C109-15VC 5V 128kx8 SRAM corner power & ground 32-pin SOJ, 400 mil 8 25 New. Not stored in dry pack. AS7C1024-15JC 5V 128kx8 SRAM corner power & ground 32-pin SOJ, 400 mil 4 25 New. Not stored in dry pack. TMS320C32PCM50 DSPs PQFP 144 pin 6 70 New. Not stored in dry pack. TMS320C44PDB60 DSPs PQFP 144 pin 7 20 New. Not stored in dry pack. XC56303PV880-100 DSPs 144 pin New. Not stored in dry pack. Please fill out the order form below and fax to Signalogic at 214-343-0163. If you are paying by credit card, then you can also fax the credit card information form. This form can also be sent via the web to Signalogic, but in this case, please note that the transmission is not secure. After receiving the order, a proforma invoice will be faxed back to you including shipping option (see below), which must be signed and returned to Signalogic to constitute the final order.